In this age of modern and advanced technology, backing the important files up is a must. We store all the projects, data files, photos, movies and music in one place i.e., our PC. Now, desktops and laptops having a quality amount of storage inside, are the places where everyone stores their files. And unfortunately, it is not safe to keep all the documents in only one place. You can lose your important files if your computer faces any kind of damage, theft, accidental deletion, loss or natural disaster. That’s where the hard drive comes into the scenario. That is why you should be prepared for the unexpected with a good backup strategy in your hand. Generally, back up means having an exact copy that will help you to get all the files back whenever you need. And you have to make sure that you are not using the same type of device to save your data in two different places. That is why a backup strategy is really important to keep your data safe. There are many ways that you can use to back up your files but the here in this article our concern is External Hard Drive. At the time of buying an external hard drive, the storage space is one of the most important specifications that you should take care of. There is no meaning of purchasing a high-speed device with remote access and encryption that lacks enough space that you actually need. And at the same time, an external hard drive with a huge space that you will never even come close to filling is of no use. The size of the hard drive should depend on what you want to do with it. If you need a hard drive to transfer photos, documents or other media from one device to the other then a mid-range flash drive can be the best bet for you. With the help of it, you can even expand the storage space of your low-end tablet or laptop smoothly. You can even get this at an affordable price. And, you can go for something bigger if you want to store a huge amount of data and even if you want to keep your folders and files on there long term. In this case, a 1TB drive can help you in every way. But, if you want something more, like if you want to store hundreds of movies and never want to run out of space then you will get a lot of hard drives in the market with multiple terabytes of space. Trust us, encrypting your data is not a bad idea, especially for your sensitive data. You will get a lot of drivers in the market having software encryption solutions, that can help you in every way. But if you want to be more secure then it is a good choice to get an external hard drive with hardware encryption. You can even opt for a physical security system if you are extremely security conscious as there are lots of drivers with strong casings that can prevent physical tampering with ease. If you don’t need an external drive for backups except for your own home, then you don’t have to be concerned about the portability. And, you can even take care of the permanent backup options. But at the same time, if you need to keep your drive with you all the time, then portability is one of the most important features that you need in your external hard drive. And at the same time, you need to take care of the size and weight of the hard drive. You should go for a hard drive that can work without an external power cable. Sometimes, you should give importance to the transfer speed as well as the size. It would not feel pleasant to you if a drive takes too much time to complete the task. Transfer speed depends on the connector and storage technology of the drive. That is why you need to know more about the drive you are heading for. And, at the same time, there are lots of options of the connector used to hook your external drive up to your mobile device, laptop or desktop, to choose from. Nowadays a USB interface is more common to be used in hard drives. As there is a stiff competition among the external drives, it is natural that there are some more features other than the above ones. And if you are still not sure which hard drive you should go for, then you can check these qualities out. And among those features are Wi-Fi connectivity for easy file access. You can even get a quality warranty from some of the hard drives. Along with that, you can even go for the hard drive having high-quality cables that the drive ships according to the conditions of your device. Your files are really important stuff, and you need to protect them as they are the fruit of your hard work. 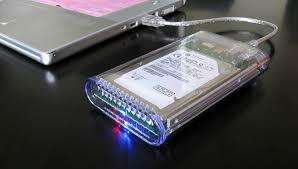 Hope after reading this article, now, you have got a full idea regarding an external hard drive. You can leave your comment behind and enlighten us with your view regarding the article. You and your view is really important to us and don’t forget to stay connected to us for more such articles.